The Microflex® Wireless MXWAPT8 Access Point Transceiver together with the IntelliMix® P300-IMX Audio Conferencing Processor deliver natural voice quality and excellent speech intelligibility for conferencing and presentations. A selection of versatile wireless microphones offer a customizable, license free AV conferencing system. 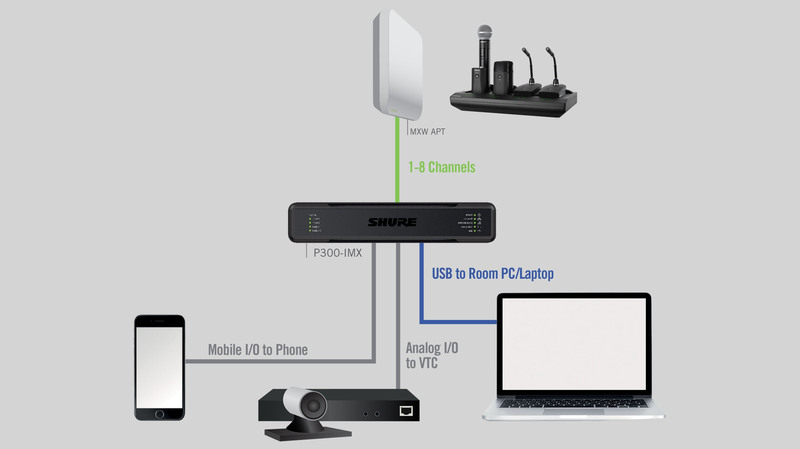 Versatile features and connectivity options provide freedom of choice when joining a a room system, a computer running soft codecs like Skype for Business or BlueJeans, or to other all-in-one collaboration devices equipped with a USB or analog audio interface. *This bundle simplifies the ordering process while offering a discounted price. Please note that these items may ship separately.